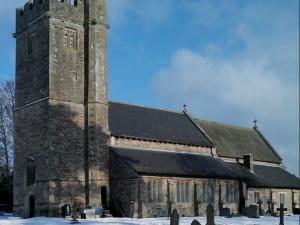 This is perhaps one of the earliest Christian sites in the county, possibly in Wales. The church is a veritable treasure-house of Roman history. When the present church was erected in the 13th century, its builders were fortunate in having a good supply of stone taken from the ruins of the Roman city known as Venta Silurum. In the 15th century, the structure was restored and enlarged, and the porch and tower were added. The fabric underwent extensive restoration at the end of the 19th century.